"A powerful book, an unflinching examination of two centuries of American yearning and desire." In a crowded amphitheater in Queens, a nervous twelve-year-old Josiah Laudermilk steps to the stage to deliver his first sermon to thousands of waiting believers. A prodigy, they called him, the next in a long line of faithful men. Decades later, though, after a failed marriage and years away from the church and his home, Josiah (now Josie) finally returns to Queens to check on his father, who seems to be losing his grip on reality. Barreling through the old neighborhood, he's flooded with memories of his past, but when he finally arrives at his family's old house, he's completely unprepared for what he finds. Reaching from 1980 Queens to present-day sunny California to a tent revival in nineteenth-century rural Kentucky, High as the Horses' Bridles is an imaginative and heartbreaking debut from a bold new American voice. 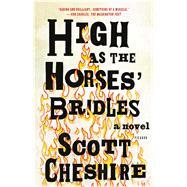 <b>Scott Cheshire</b> earned his MFA from Hunter College. He is the interview editor at the <i>Tottenville Review</i> and teaches writing at the Sackett Street Writers' Workshop. His work has been published in <i>Slice</i>, <i>AGNI</i>, <i>Guernica</i> and the Picador anthology <i>The Book of Men</i>. He lives in New York City.